File handler, Database connection, socket connection are example of unmanaged resource. .Net garbage collector is designed to handle managed code. We need to implement IDisposable interface when we are using unmanaged resource directly. Using : If object is implementating IDisposable interface we can use Using keyword, which will call objects Dispose method. Try/Catch/Finally: We can call Dispose in finally. A base class with subclasses that should be disposable must implement IDisposable as follows. You should use this pattern whenever you implement IDisposable on any type that isn’t sealed. To implement Dispose method for custom class, you need to implement IDisposable interface. IDisposable interface expose Dispose method where code to release unmanaged resource will be written. Finalize method is called destructor of the class. Finalize method can not be called explicitly in the code. Only Garbage collector can call the the Finalize when object become inaccessible. Finalize method cannot be implemented directly it can only be implement via declaring destructor. GC.SuppressFinalize() simply prevents the finalizer from being called. Since the finalizer’s only task is to free unmanaged data, it doesn’t need to be called if Dispose() was already called (and already freed all unmanaged data by calling the finalizer). Using GC.SuppressFinalize() give a small performance improvement but nothing more. The base method is called last to ensure that child classes are disposed before their parent classes. Process is nothing but executing program. Process has a unique process ID. 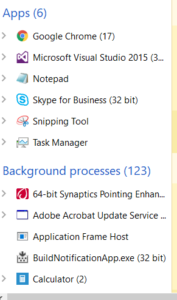 We can view the process within which program is being executed using windows task manager. Here we can see different programs running under different process. Another example is calculator program. When we start calculator program, calculator process will start. Thread is light weight process. A single process can have multiple threads. Threads are the smallest unit of execution scheduled by the operating system. Any program or application has a minimum of one thread be it web application or a console window application. Main purpose of threading is do parallel code execution. By default foreground thread is created. Even if main application quits, then also foreground thread will continue to execute. 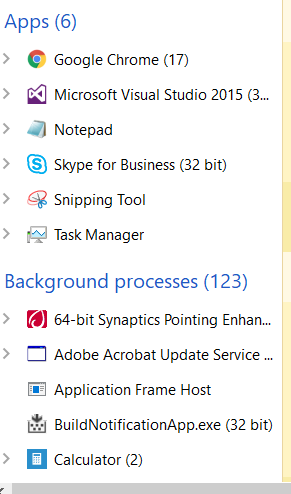 In case of background thread,when main application quits, background thread quits. Purpose: To make Application responsive. If we want to debug 1 thread and pause another thread using freeze option and start it using Thaw option. Use break point option- conditional debugging. If object is behaving abnormally in multi threaded environment, it is not thread safe. Example: Divide by number program in loop where we set Num1 = 0 and Num2 = 0 after Num1/Num2. Here DividebyZero exception is raised. So user needs to ensure that only 1 thread is accessing the critical section. Mutex works across multiple programs/Process. We can have global mutex. Mutex are objects that are owned by owned by thread at a time. Other threads are forced to wait until first thread releases it. There is 1 room having 1 key to it.Now 3 persons want to use it. Person who has key can access the room. Similarly Mutex is object owned by thread so there is ownership in mutex. Mutex allow 1 thread to access the resource. A Semaphore restricts the number of simultaneous users of a shared resource up to a maximum number. Semaphore is signalling mechanism. It allows a number of thread to access shared resources. A semaphore is like nightclub, it has certain capacity enforced by bouncer. Once it is full no more people can enter & a queue is build up outside. Then for each perosn that leaves, one person enters from the head of the queue. We want to run the logic parallely and it should use the CPU power to maximum. If my machine is 2 core processor then it should run half the iterations on 1 processor and another half on second processor. However that doesn’t happen and everything runs on 1 processor. This can be verified using perfmon tool. Thread 1 and Thread 2 – It switches time between threads. it is called time slicing or context switching. Two Processors-> Expectation is Processor 1 should execute Thread 1 and Processor 2 should execute Thread 2. Purpose: To utilize CPU power to maximum. TPL encapsulates multi-core execution from end user. How TPL does thread pooling?